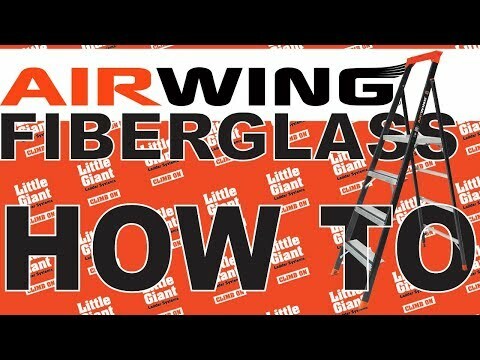 The Little Giant AirWing® Fiberglass is engineered to be a safe, highly mobile stepladder for tradesmen and working professionals. The lightweight AirWing opens easily from a 3” storage profile, yet its patent pending pivoting steps offer comfortable 4.5-inch treads on each rung, with a very spacious, comfortable standing platform at the top. With a lightweight, slim profile and special duty construction (ANSI Type IAA – 375 lb rating), the AirWing is the perfect, safe, yet portable climbing solution for any jobsite. The AirWing Fiberglass Stepladder is available in 4, 5, 6, and 8-foot sizes. I love the ladder. It is so sturdy and I feel really safe on it! Weight Capacity 375 lbs. 375 lbs. 375 lbs. 375 lbs. A-Frame Min. Height 4 ft. 3 in. 5 ft. 3 in. 6 ft. 3 in. 7 ft. 3 in. A-Frame Max. Height 4 ft. 3 in. 5 ft. 3 in. 6 ft. 3 in. 7 ft. 3 in. Max. Highest Standing Level (Platform) 1 ft. 11 in. 2 ft. 10 in. 3 ft. 9 in. 5 ft. 7 in. Storage Height 4 ft. 3 in. 5 ft. 3 in. 6 ft. 3 in. 8 ft. 4 in. Storage Width at Base 1 ft. 9 in. 1 ft. 10 in. 1 ft. 11.5 in. 2 ft. 1 in. Storage Depth 3 in. 3 in. 3 in. 3 in. Footprint 2 ft. 3 in, 2 ft. 10 in. 3 ft. 5 in. 3 ft. 5 in. Rung Size 4.5 in. 4.5 in. 4.5 in. 4.5 in. Platform Size 13.25 in. x 14 in. 13.25 in. x 14 in. 13.25 in. x 14 in. 13.25 in. x 14 in. Ladder Weight 14 lbs. 19 lbs. 23 lbs. 32 lbs. Shipping Weight 16.2 lbs. 22 lbs. 26.5 lbs. 37.5 lbs.